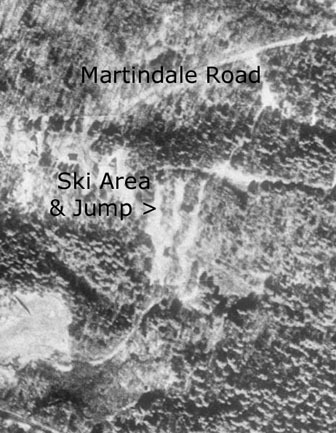 Competitive skiers trained and competed at a larger area and jump in Bernardston about a half-mile up Martindale Road, on the southeast face of Snow Hill. The school and its students developed this area shortly after World War II. Earthen remains of the twenty-eight meter jump run from the ridge toward the present Agway plant on Route 10. The wooden-trestle in-run was replaced by a graded run of dirt fill in the early 1960’s. Additional work at this time involved regrading the jump’s transition and out-run, which originally sloped slightly toward the southeast. The newer out-run remains eighteen feet above the former grade. The four-foot lip, shored by cribbing of telephone poles and posts, is intact and, with some cutting back of brush and tall grass, the jump would still launch those who dare. The small ski area to the north of the jump featured two short slalom runs with a warming cabin at the top. Young forest growth marks the narrow runs and, though the cabin burned to the ground, the large stone fireplace and chimney as well as a fire pit remain about a hundred yards to the north of the jump’s in-run ramp. The log base for a rope tow motor is evident just south of the cabin. An older rope tow ran about twenty-five yards to the south of the jump, along a barbed-wire fence, until about 1956. Parts of this tow were relocated to Chapel Hill and later to Millers Falls. The school continued to improve the jump and ski area, adding several trails south of the jump in the 1960’s. Competitive skiers trained and competed on these slopes until 1970, when they were bussed to the larger area at Thunder Mountain, now Berkshire East, in Charlemont. The last brave skier leaped in 1980, when the school closed the jump for insurance purposes. In addition to the rope tow hill, Mt Hermon had a second ski hill. This second hill was located off the campus on the hill north of Northfield Road by the railroad tracks on the way to Bernardston, MA. This hill was used by the varsity alpine team and the Nordic jumping team, as in addition to two slalom runs, there was a 35M jump. The skiers had to climb as there was no lift to provide service. The hill had to be boot packed. 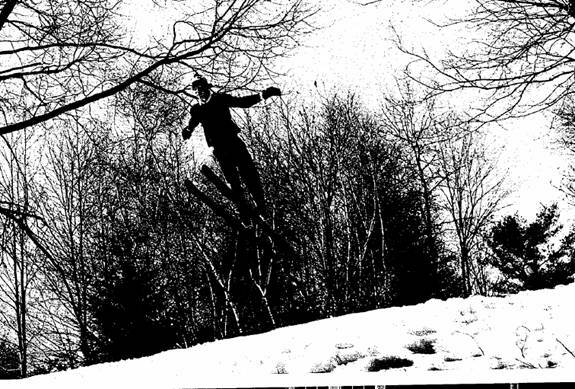 The picture on the right is of one of the Nordic jumpers from the 1976 yearbook. Climbing for alpine elicited nothing but complaints; however, the jumpers eagerly ran up the hill to get in another jump. The jump out-run could be dangerous in icy conditions as it was rather short and ended with a steep fall to the railroad tracks. I am not sure when this hill ceased being used, but it appears to be overgrown now. Ed Pitoniak: The other ski hill was off campus, just off of Route 10, on a hillside near what is now an Agway distribution plant (at least I think Agway is still there). That hill consisted of a race hill and a ski jump. It might've had 200 feet of vertical and a decent amount of pitch. I never actually went to the hill itself (I was a hockey player back then), but did see it from the highway when passing by. That hill was still used all during my time there but probably closed down shortly thereafter. Eric Gouvin: It's located off Depot Road in Bernardston near the Gill line (not Northfield) on the Mount Hermon side of the Northfield Mount Hermon School. The hill is visible from Route 10 as you head west from the main gate at Mount Hermon. On your right you see the Agway grain elevators near the railroad tracks. On the other side of the tracks is a small but relatively steep hill that used to be the Mount Hermon ski slope. The hill itself is not very impressive, but I've been told by old alums that there used to be a rope tow going up the hill serving a handful of trails. On stark winter days you can still see the vestiges of some of the trails. It has not been used in a long time.